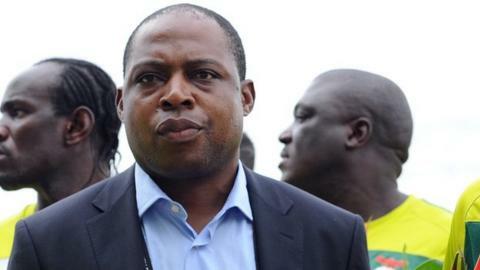 Zambia's greatest player Kalusha Bwalya believes African football is failing to reach its potential because of a "prima donna" attitude from some stars. The 1988 African Footballer of the Year has urged players to take responsibility for their actions. "I hear so many times that when players come back to play for their respective countries, they want to be treated them like prima donnas," he told BBC Sport. "When some Africans become big stars it can lead them to be ill disciplined." During his career Bwalya spent five years at Dutch side PSV Eindhoven, so he understands the demands of playing abroad and travelling back to represent his country. And the 49-year-old believes there is no excuse for players to not respect their national sides - or to continually turn up late for training camps - drawing a comparison with the commitment he himself showed for his club. "When I was at PSV, I was late [for training] maybe twice," said Bwalya, who made 147 appearances for Zambia and is their most capped player. "Once was because the time was changed and the other because I was caught up at a railway line near the training ground and I had to wait there for 10-15 minutes. "Why can they not exhibit the same discipline that they have in Europe?" Bwalya believes it is this discrepancy that is preventing African teams from being the best they can be. "The African player is the most resistant in the world; he can play in the snow, he can play in 40 degrees, 50 degrees, he can play when it is raining," Bwalya told BBC's World Football programme. "He can play in Mexico, he can play in Africa, Asia, everywhere. "We have the best product but we are not able to nurture that talent. "My coach always used to say that if you have shortcuts in training then it will eventually show on the pitch. "Unfortunately I hear so many stories of football indiscipline, mixed a little bit with outside indiscipline when players in Africa all of a sudden become big stars. "It should be an obligation for our players to behave for their national teams as well as they behave in Europe for their clubs." Bwalya has also called on players to lead by example, so that future generations of players will act in the appropriate way. "I want to also commend players like Didier Drogba - he is always there for his national team and exhibits the same commitment he does for his club. "And everybody aspires to be a star like Drogba or Samuel Eto'o. So it is important that when players come back to Africa they show the same discipline because there are millions and millions of people following them in whatever they do."